Over the last several years I have done outreach on a major college campus (The Ohio State University which has close to 60,000 students). I have had hundreds of spiritual conversations with students and direct an apologetics ministry called Ratio Christi Student Apologetics Alliance. 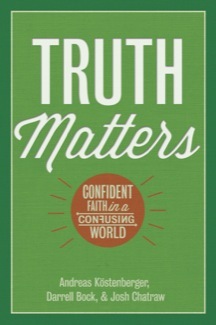 It is no secret that many apologists have written books on the Truth question. In other words, the statement “we are living in postmodern times” has almost become cliche in today’s society. Hence, because of the impact of post-modernism, many seem to assume that college students are not interested in objective truth. So the supposed fallout is that people are not asking whether Christianity is true. Given my experience on the campus, I will respond to this issue. So the good news is that I am speaking from personal experience. Truth is not “what works.” One popular theory is the pragmatic view of William James and his followers that truth is what works. According to James, “Truth is the expedient in the way of knowing. A statement is known to be true if it brings the right results. It is the expedient as confirmed by future experience.” That this is inadequate is evident from its confusion of cause and effect. If something is true it will work, at least in the long run. But simply because something works does not make it true. This is not how truth is understood in court. Judges tend to regard the expedient as perjury. Finally, the results do not settle the truth question. Even when results are in, one can still ask whether the initial statement corresponded to the facts. If it did not, it was not true, regardless of the results. What Truth Is: Correspondence with Reality Now that the inadequate views of the nature of truth have been examined, it remains to state an adequate view. Truth is what corresponds to its referent. Truth about reality is what corresponds to the way things really are. Truth is “telling it like it is.” This correspondence applies to abstract realities as well as actual ones. There are mathematical truths. There are also truths about ideas. In each case there is a reality, and truth accurately expresses it. Falsehood, then is what does not correspond. It tells it like it is not, misrepresenting the way things are. “In relation to truth, both the Old and New Testament terms for truth are emet and alethia. In relation to truth, these words are associated with fidelity, moral rectitude, being real, being genuine, faithfulness, having veracity, being complete. (7) According to a Biblical conception of truth, a proposition is true only if it accords with factual reality. There are numerous passages that explicitly contrast true propositions with falsehoods. The Old Testament warns against false prophets whose words do not correspond to reality. For example Deuteronomy 18:22: “If what a prophet proclaims in the name of the Lord does not take place or come true, that is a message the Lord has not spoken”, and the ninth commandment warns against bearing false testimony.”-Moreland, J.P. and W.L. Craig. Philosophical Foundations for a Christian Worldview Downers Grove, IL: Intervarsity Press, 2003, 131-132. So after reading these tests for truth, what do I see out there? The most popular view today seems to be a pragmatic view of truth. I see it everywhere! Many people tell me that all that matters is the benefit of a religious belief. In other words, if it makes a difference and helps someone is the test of truth. So what does this mean for us? Realistically speaking, I suppose Mormons can testify as to why Mormonism helps them have strong families. Black Muslims can testify in prison that Islam has helped them be more responsible. I could go on with more examples. Hence, many people are not asking whether it is objectively true. Comments like “I don’t see what difference Jesus would make in my life” and “I don’t think it is relevant whether God exists or Jesus is the Son of God” are somewhat common. This shouldn’t be surprising given our entire culture is built on pragmatism. After all, people go to college to get a job that will work for them to make a good living. Furthermore, the Church has been embracing pragmatism for a long time. John MacArthur wrote an article called Church Pragmatism a long time ago. Not much has changed. So you may say well it is nice that we have some success with our apologetic speakers. But what about all those people that just don’t care or don’t respond to apologetic arguments? My response is the same as it has always been. I share the Gospel, answer objections and if I see people are lapsing into a pragmatic or subjective view of truth, I simply say “So the first question is whether the Christian story is actually true.” In other words, I just bring the person back around to the issue of objective truth. Believe it or not, many people say tell me that once they think about what I am saying it is clear that it does matter if Christianity is objectively true. How they feel about whether God exists or the resurrection of Jesus won’t change the fact as to whether it is objectively true and corresponds to reality. So I think it is incumbent upon me to explain what objective truth is and how the person can’t avoid it! Why not stick with pragmatism? So why not ask the question as to whether religious beliefs can be tried and tested out in the reality of life? This does have some merit. After all, if the Christian faith is the one true path, it should make a radical difference in the reality of life. The challenge of this argument is that in some cases, it seems Christianity doesn’t work. Christians have challenges in their families, work related issues, and relationships. However, just because Christians don’t always reflect the character of Jesus and don’t always show the difference it makes, this doesn’t mean Christianity is false. So the pragmatic argument can be a tricky one. If I was to stick with the pragmatic view of truth, sadly, when it seems Christianity doesn’t work, people tend to leave the faith and pick another spirituality. Trust me, it happens all the time. So in conclusion, I think that apologists are responsible for taking people back to the correspondence theory of truth. It is this test for truth that we live our lives by on a daily basis.